Tyson Fury and Hall of Fame promoter Frank Warren are joining forces with Hall of Fame promoter Bob Arum’s Top Rank. 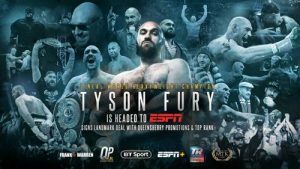 The agreement will mean that Fury will be a headline part of the boxing lineup under the historic, long-term Top Rank on ESPN relationship. Since announcing the Top Rank on ESPN agreement in 2017, and expanding it in August 2018, the comprehensive alliance has showcased blockbuster Top Rank fights and content across ESPN networks and ESPN+. Top Rank, Fury’s management team MTK Global, and Queensberry Promotions, worked seamlessly to close the groundbreaking deal. “MTK Global are thrilled to have played a role in what can only be described as a monumental partnership, no doubt the biggest one in the boxing industry, and we’re looking forward to working more closely with the teams at Top Rank and ESPN well into the future,” says Sandra Vaughan, CEO MTK Global.